Apple livestream: iPad Mini launch video shuts out Windows, Android users. 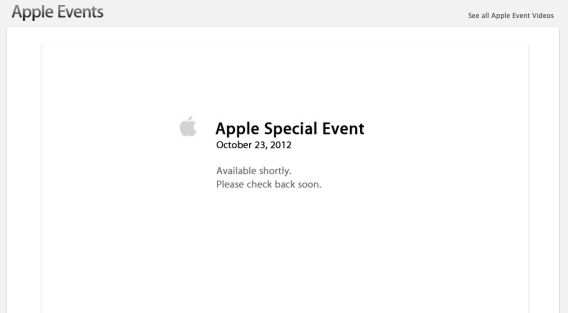 Apple is live-streaming its iPad Mini launch, but only for existing Apple customers. Apple usually doesn’t live-stream its product launch events, but today it’s offering fans a chance to watch live as it unveils a new, smaller iPad. And by fans, I mean people who are already Apple customers. According to Apple’s events page, the livestream is only available on iPhones, iPads, Apple TV, and Apple’s Safari browser, which comes installed on Macs but not PCs. So it seems Windows and Android users will be left to read the live-blogs if they want to be among the first to hear about the new devices. Many will probably scoff that they didn’t want to watch the stupid event anyway. Still, it seems a rather cold shoulder to give to millions of potential future customers. Some have suggested this is a way to reward loyal customers for their business, but there are all kinds of ways to reward loyal customers that don’t involve snubbing the vast majority of Internet users who browse on Chrome, Internet Explorer, or Firefox. Perhaps it’s a capacity issue: The hardware constraints will surely result in a more manageably sized audience. For the Safari and iOS crowd, Apple’s live stream of the event is here: http://www.apple.com/apple-events/october-2012/ It begins at 1 p.m. eastern time.